You cannot go anywhere these days without reading or hearing about the health benefits of kale. It is a superfood full of vitamins, fiber, and cancer fighting antioxidants. I have to be honest, I was late to ride the kale train. I was afraid of it. I had a fear of dark greens. Let’s just say that collards and I go way back, and it wasn’t pretty. These days, I really like kale. I started to like it by drinking it. I love a green juice in the morning, and I always add a handful of kale to my juice. After that, I started ordering it in restaurants. Kale Caesar Salad is absolutely delicious. And now, I can eat it any which way. Even for breakfast. 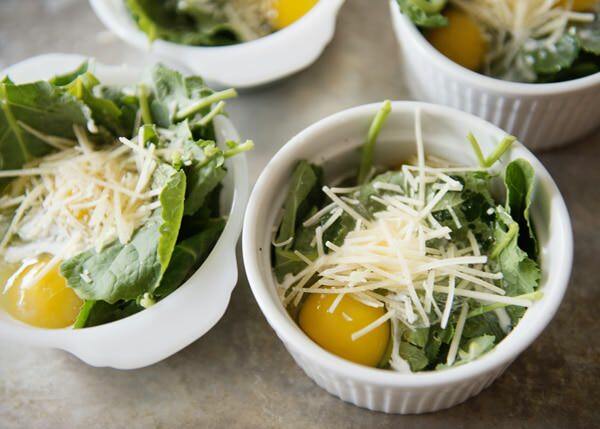 In my quest to eat healthier, protein packed breakfasts, these baked egg cups could not be a better way to start the day. You can put these together in two minutes flat and stick them in the oven while you are putting your makeup on. 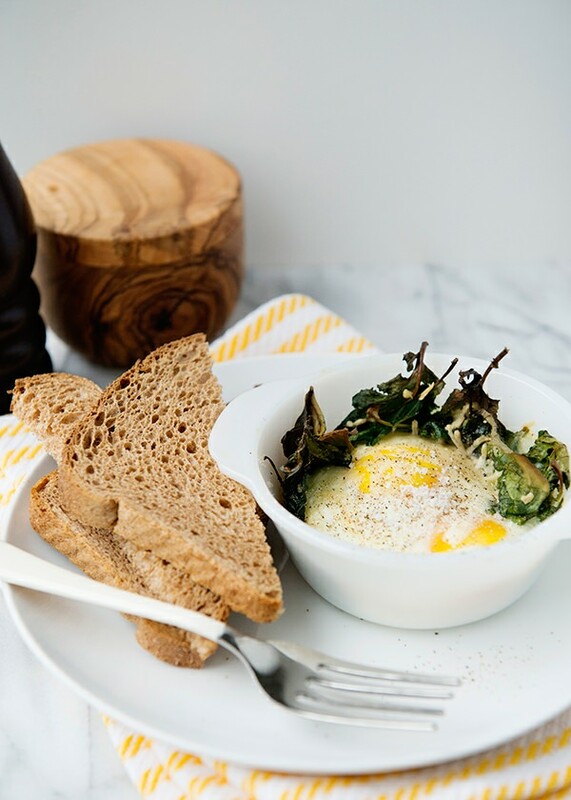 20 minutes later you have a hot breakfast that is hearty and full of good things. You can make a vegetarian version like I did, but you could add some cooked sausage or crumbled bacon before baking. Cheddar cheese is also really good. Rick Bayless was right, kale is a flavor trend that is not going anywhere. Preheat oven to 400 degrees. Spray 4 (1-cup) ramekins with cooking spray and place on a baking sheet. 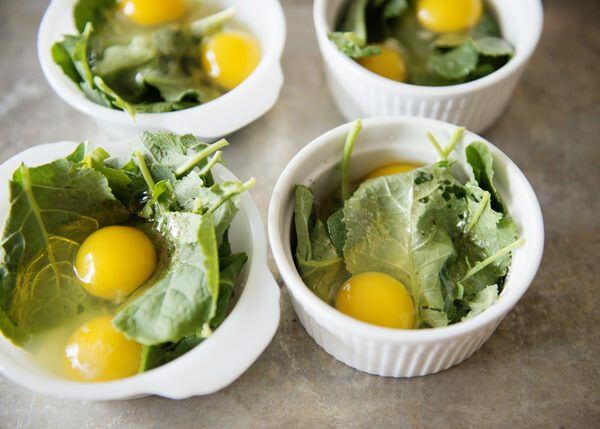 (You could do this in a muffin tin too) Add 1/2 cup kale to each ramekin. 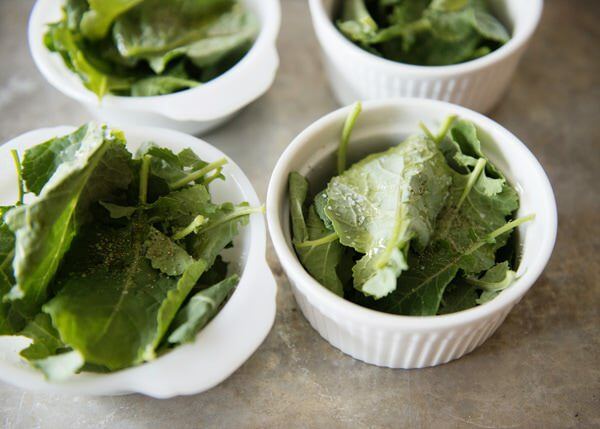 Drizzle the kale with olive oil and season with salt and pepper. 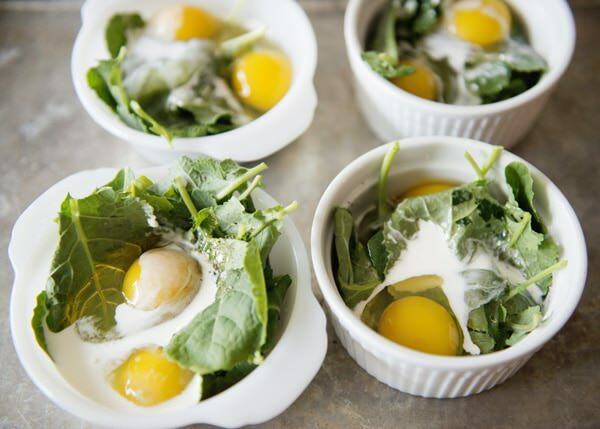 Top each egg with one Tablespoon heavy cream. Sprinkle with one Tablespoon Parmesan cheese. Bake for 20 to 25 minutes, depending on how runny you like your eggs. Preheat oven to 400 degrees. Spray 4 (1-cup) ramekins with cooking spray and place on a baking sheet. 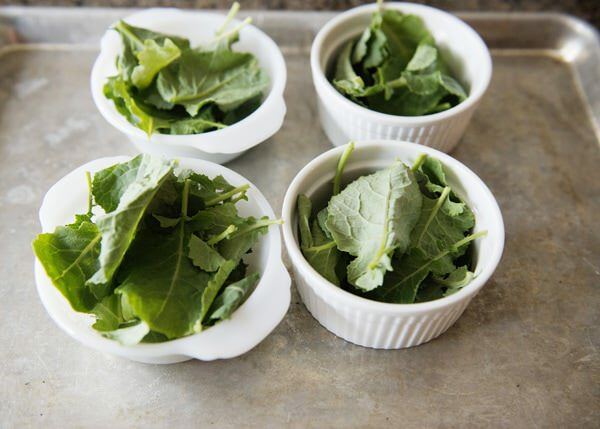 Add 1/2 cup kale to each ramekin. Drizzle the kale with olive oil and season with salt and pepper. 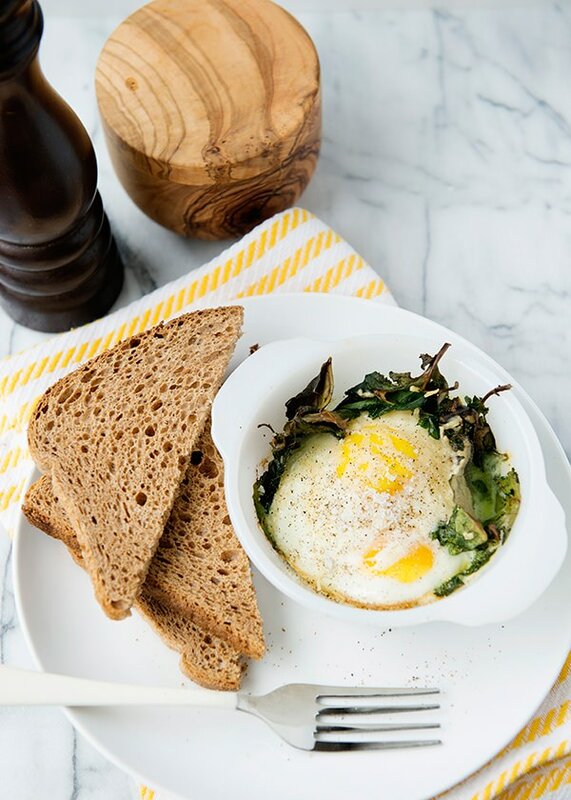 Crack two eggs into each ramekin. 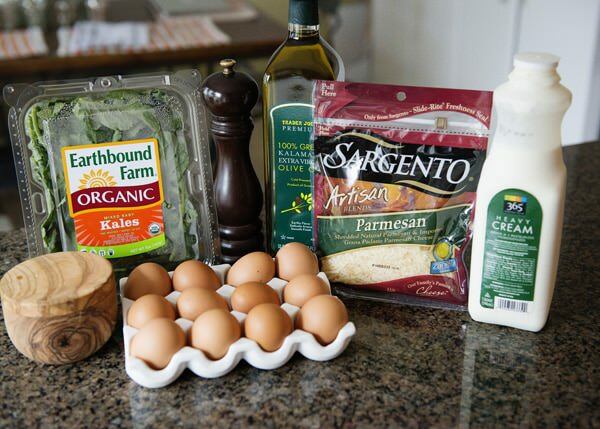 Top each egg with one Tablespoon heavy cream. Sprinkle with one Tablespoon Parmesan cheese. Bake for 20 to 25 minutes, depending on how runny you like your eggs. Season with salt and pepper. I need more kale in the morning! This looks fabulous! We should eat kale every day! It is so good for you. These look awesome! 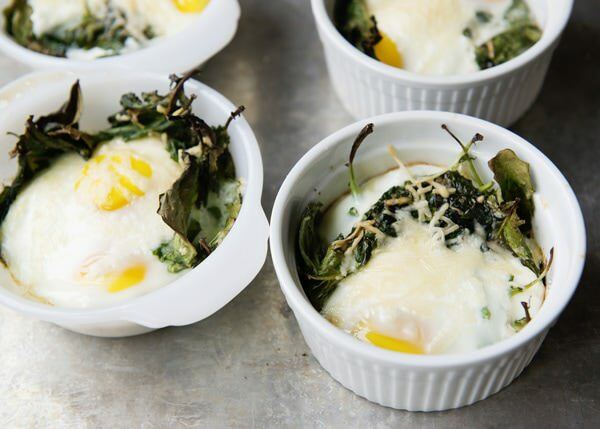 I love kale, eggs and cheese! 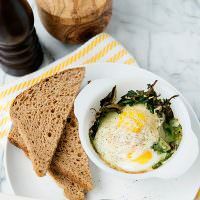 I love kale, and eggs, and this looks awesome! I could pop it in the oven on a Sunday and get a few more minutes of shut eye, hehe. thanks for the recipe. i never quite know how to use kale, need to give this a try! You are welcome! It is so easy to make and so good for you! You are welcome! I am trying to eat more kale, and this is an easy way to get it in. Oh this looks so tasty and such a easy recipe. I’ve mostly had kale in salads, some soups and tried the chips but baking with egg is new. Thank you so much. I’d certainly be more cheerful in the morning if I have this waiting for me at the breakfast table with a cup of black coffee. I love how decadent this dish looks yet so simple to make. It is simple, perfect for a busy morning! This looks fantastic! 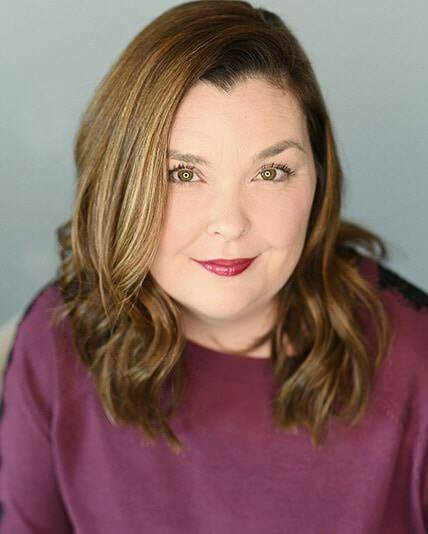 I, like you, have been super afraid to try kale (collards and I don’t mix well, either) and have been slowly adding it into my smoothies, doing a 1/2 and 1/2 mix in my salads, and now I think I’m ready for something a little more….”adventurous” Thanks for posting! Now I really like it. I LOVE a kale Caesar. This sounds great! I’m going to try it tomorrow morning! I, too, was late to the Kale Train, and have been playing catch-up! I recently bought this product called The Stone-Wave, I believe. It’s a ceramic bowl with lid and handle, and cooks an onion in 1 minute in the microwave! You can also cook poached eggs with it. I’m going to try this recipe in it! Thanks for the tip! I need to check that thing out! Hi Bree! LOOOOOVE your website.. i make your recipes all the time.. can i do this with spinach instead of kale? i am not a kale fan.. Thank you for this recipe. It was fantastic. 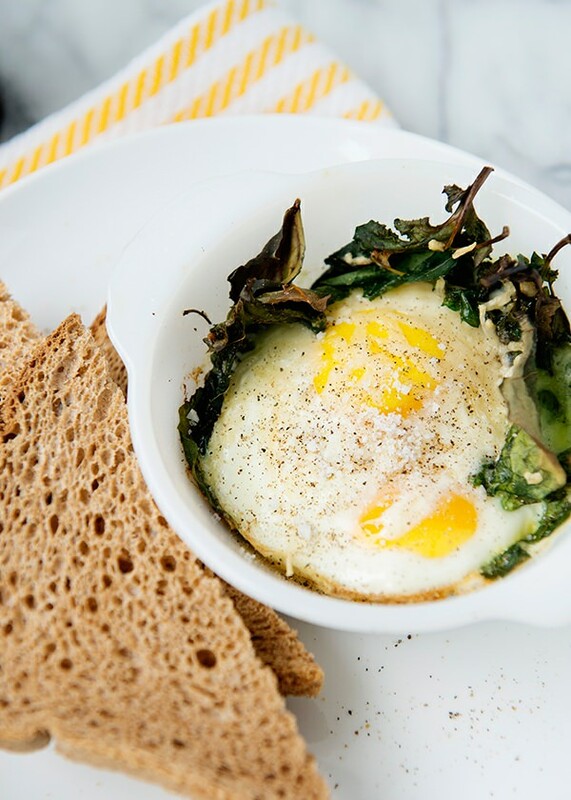 I was looking for something easy to make with kale and eggs for breakfast and this recipe fit my goals perfectly. Do you know how long these would last in the fridge if I were to make a batch of these ahead of time? Thanks. I am so glad. I would say a day or two. I stumbled across this recipe a months back, and decided I needed to try making it for my wife as she is a kale and cheese fan. Huge hit. Tomorrow morning will mark the tenth time we will have this for breakfast. Thanks for the fantastic breakfast idea! You are welcome Tom! So glad that you like it so much. 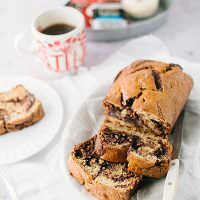 Thanks for this terrific recipe! Planning on making it again tomorrow 🙂 Probably will double the kale. Just be careful, if it gets too watery from the kale, they won’t set.